Love the orange color in this! Adorable design (those cool legs--LOL), Lucy!! Love it!!!!!! Coolio legs!!!! too funny! LOVE LOVE it! What a cute monster! Great card. love this one! such fun! So clever, Lucy! 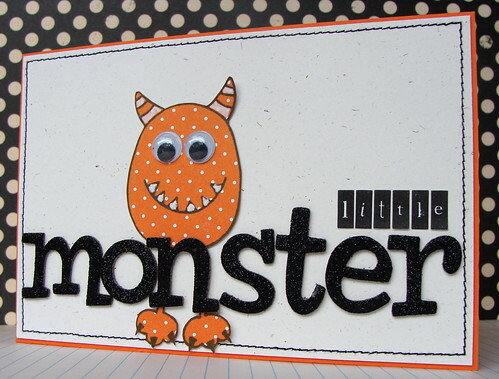 Love how you used the letter "n" for the sweet monster's legs! Adorable card! wonderful, so sweet and I love the colours too!! So super cute Lucy, love Mr Smiles, he really does make you smile, love how you extended the legs, so creative. Super fun and cute, Lucy! Love his legs...too clever! so cute! love his longer legs. such a fun card! He's so adorable! Love the striped horns!